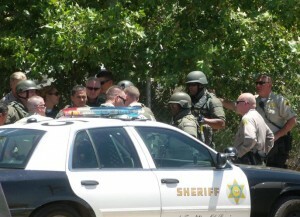 Juan Moreno was captured after a three hour search in Quartz Hill. Photo by LUIS MEZA. More than 30 deputies took part in the search. Photo by LUIS MEZA. 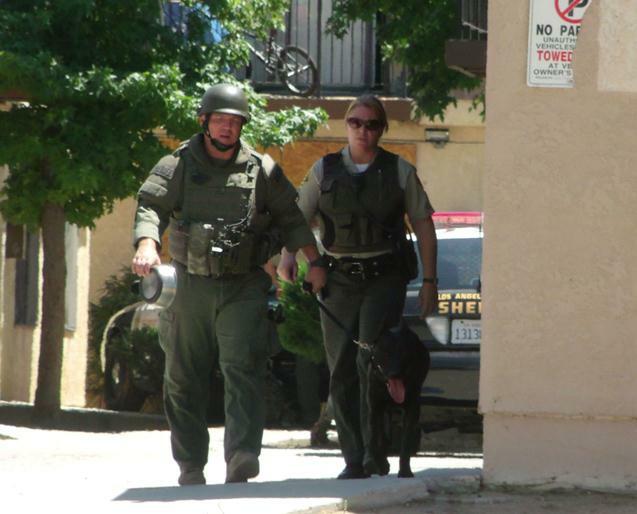 QUARTZ HILL – More than 30 sheriff’s deputies, a K-9 unit, two air units, and the Special Enforcement Bureau Team descended on Quartz Hill Thursday afternoon to catch an alleged car thief who was forcing his way into residences to escape capture. 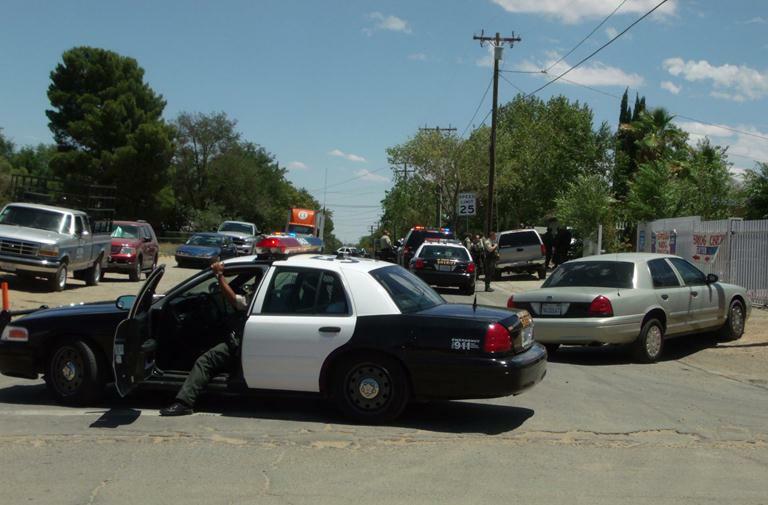 The incident happened around 11 a.m. near the intersection of 50th Street West and Avenue L-10, where deputies spotted a car that had been stolen in Palmdale a few days ago. “The suspect saw the deputies and he ran from them, then he forced his way into two separate apartments,” said Lancaster Station spokesman Michael Rust. A “search dog” from the K-9 unit led deputies to Moreno. The dog bit Moreno on the arms, officials said. Photo by LUIS MEZA. Coincidentally, special teams were in the area conducting parole and probation compliance checks, and they were diverted to help capture the fleeing car thief, Rust said. 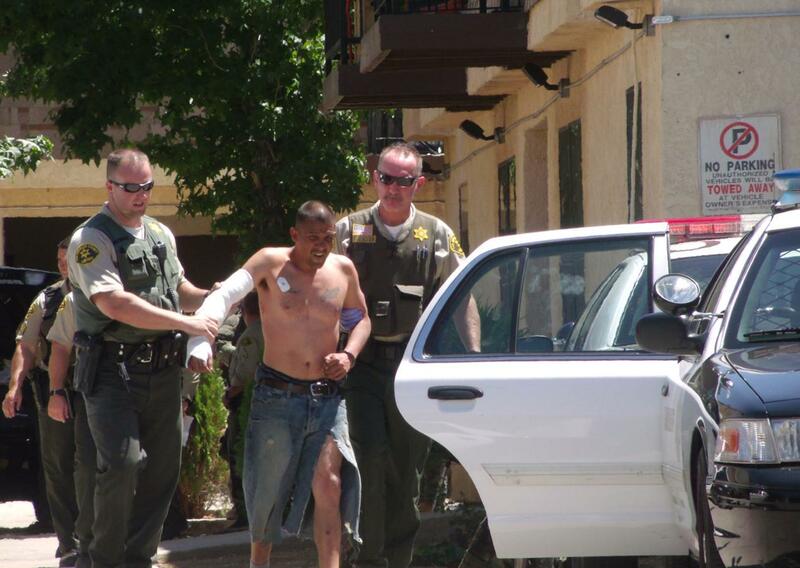 Shortly after 11 a.m. Thursday morning, Lancaster Deputies located a vehicle theft suspect near the intersection of 50th Street West and West Avenue L-10 in Quartz Hill (unincorporated county area). 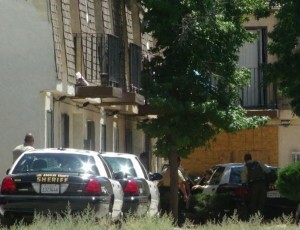 When the suspect saw the Deputies, he ran east into an apartment complex located in the 4800 block of West Avenue L-10. Moreno forced his way into one apartment, and when he found someone inside, he jumped out a second story window. Photo by LUIS MEZA. 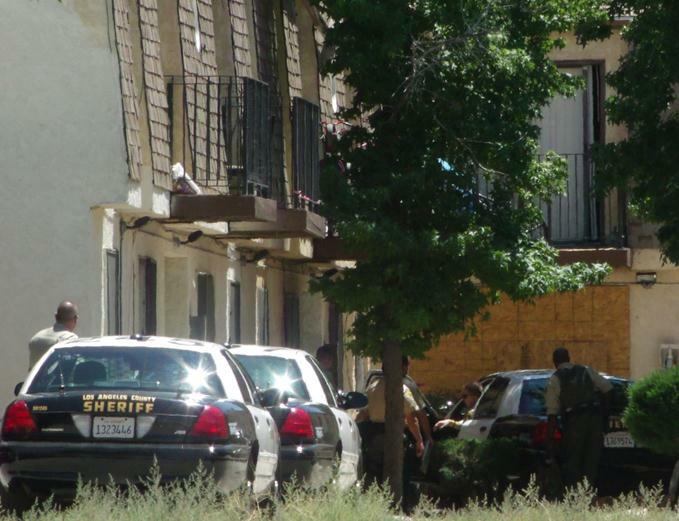 Once inside the complex, the suspect forced entry into two separate apartment units. One of units was occupied and the suspect exited the unit by jumping from the second story window. He was then seen running east through the complex. Deputies quickly contained the surrounding area and requested the help of a Sheriff’s K-9 unit. When the K-9 unit arrived, the “Search Dog” led the Deputies to a third apartment that had been forcibly entered. The suspect was located inside and arrested. The suspect (Juan Moreno) was transported to a local Hospital where he received treatment for dog bites as well as injuries he sustained after jumping from the window. Moreno will be booked at Lancaster Station and faces several felony charges including, vehicle theft, burglary and home invasion. Authorities contained the area, between 45th and 50th Street West and Avenue L-8 and L-12, to search for Moreno. All residents in the area were advised to stay inside and lock their doors. Photo by LUIS MEZA. 32 comments for "Suspected car thief captured in Quartz Hill"
It’s kind of ironic that he was arrested in that particular complex. I used to live there and he had befriended myself and several others around there. A friend and her boyfriend were arrested there a while back and as soon as law enforcement cleared out, this guy went and pillaged my friends apartment taking anything of value. This included all of her electronics as well as my stereo system that she had put away for me. He also stole my laptop computer under the pretense of making payments which he then turned around and sold never paying me. I am glad this lowlife is finally off of the streets. well, another food stamping, welfare, section 8, lowlife, is off the streets..Bravo to all involved in ridding our streets of scum like this! Great job to the dog! you deserve another treat..
you’re kidding, right, Bobo? or are you just one of those bleeding heart liberals? get real!!! Finally…we have a winner! Now I know why they call you “Bright”. I was waiting to see who could figure out that I was being absurd. Why is everybody so serious here. I don’t think there’s anybody that P.C. on here (maybe I’m wrong). Anyway, congrats to the LASD….and that dog!! Bobo…out! Why do u assume he will be deported? Because of his name? racist!!!!! Now that this poor little puppy was forced to take a big bite of human excrement, will it have to get special treatment? Mouthwash? Doggie Head shrink? Protests by the National League of Stupid People, Antelope Valley branch? Poor puppy having to go through this “stuff”. Because Innocent people run from the police! Please! Oh! And they also break into strangers apartments. I wish the dog would’ve ripped his arm off…just sayin. Don’t wish upon others because you never know when you run into a dog that moight rip your arm out. Just saying..
Don’t wish upon others because you never know when you might run into a dog that might rip your arm out. Just saying..
Good doggy! Glad they caught this POS. Let the dogs loose on all these losers. My family has lived here in quartz hill for almost 16 years and i think this has been the worst of all the problems the sheriffs dept has had in those years. my home is on L-10 and they had it shut down from L8-L12(50th) & 45th -52nd(L10)from what i was able to see coming back home yesterday about noon. We live in the area, and my wife saw all the stuff going on, so we turned on our scanner to listen. The officers did great, but it was the dog who found him. They kept saying, the dog won’t leave the window of unit 14, he is pretty sure the guy is in there. A few minutes later they announced that he was. That dog needs a steak dinner. I think the dog got his steak already. The dumbarse who committed the crimes. So tired of these friggen criminals, turn the dogs lose for a few days and lets all have steak. LOL, Do we all have scanners out here in Quartz Hill or what? Mine may be an old bearcat that is arguably as old as I am, but it works to know whats going on when the ghetto bird loiters in the area. hey everybody….INNOCENT TILL PROVEN GUILTY. Could be a big misunderstanding. Frank…you have some inside information? Sure and that’s why the idiot forced his way in to 3 apartments tryin.g to get away. Lucky he wasn’t shot by one of the occupants…or not! Think the dotty ripped his pants. Love it.